Rui Miguel has become the second CSKA Sofia player to join Mixu Paatelainen at Rugby Park. Kilmarnock have signed the Portuguese striker, Rui Miguel, on a one-year deal. The player has been training at Rugby Park during the last few days and has agreed terms for a 12-month contarct. The 26 year-old forward arrives in Ayrshire with a decent reputation. He was at CSKA Sofia last season, where he scored eight goals in 33 matches for the Bulgarian club. 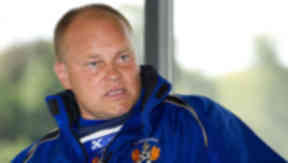 However, he parted company with them in August and recently caught the eye of Killie boss, Mixu Paatelainen. Miguel will now renew acquaintances with his former team mate, David Silva, who also played for CSKA, and the team's supporters will be hoping that the duo acclimatise quickly to their new surrounmdings. Paatelainen, who is gradually rebuilding with limited resources, is certainly optimistic that wil happen. "Rui is a good striker. He's got good technique, he can link up play, and he can score goals," said the manager. "Hopefully, he can do a good job for us."